The time traveler known only as Noah has several interesting things to say. We didn’t believe him, do you? Ingersoll Lockwood wrote a series of books detailing things that seem to have occurred after he died. Mainly, the adventures of Baron Trump… hundreds of years before Baron Trump would be born. The story also included other details that suggest the author was familiar with the current day Trump family and the United States presidency. The story gets strange when we point out that John Trump, Donald Trump’s uncle, was the person responsible for going through the notes that Nikola Tesla left behind when he died. In those notes, a strange time manipulation field is mentioned. Could it be that John Trump was actually John Titor or had seen John Titor’s future post war world? 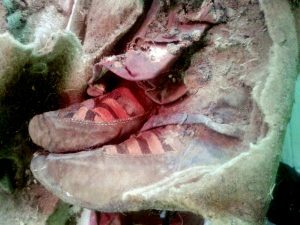 A photo of a 1000 year old Mongolian mummy that appears to be wearing Adidas shoes. 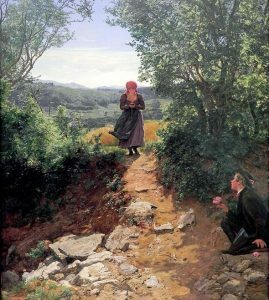 A painting done in 1850 that shows a scene reminiscent of today; a woman staring at her phone while walking, not paying attention to her surroundings. 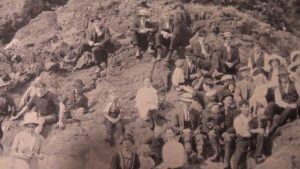 A photograph from 1917 that shows several individuals in period dress… except for the strange figure on the right hand side. 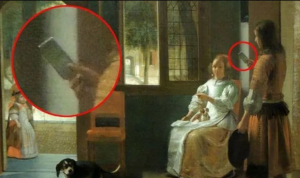 Another painting, this time from 1670, that appears to show a woman holding on to what looks like a cell phone. A painting of explorers reaching the new world, done in 1937. Can you find the suspicious looking character that seems to be checking his cell phone? 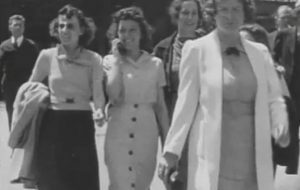 Four women out for a walk in 1938. One of them appears to be talking on a cell phone… 50 years before cell phones were as small as the one pictured. 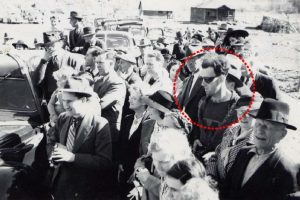 A modern day hipster, complete with camera, dark sunglasses, and graphic t-shirt… caught on film in 1941. An animated gif showing a short clip from a Charlie Chaplin film made in 1928. The suspicious looking woman seems to be talking on a cell phone as she passes by the camera.